Your heating and cooling equipment is a large investment. To protect that investment and make it last as long as possible, an HVAC maintenance agreement is a must. 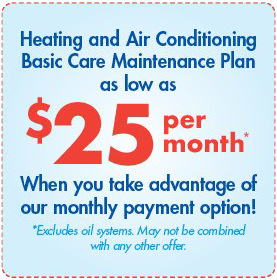 Oliver offers various heating and cooling maintenance agreements to fit your budget and desired coverage. All of our plans give you priority service and great discounts on future repairs and replacements. Please view the different plans listed below. In addition, an HVAC maintenance plan will help lower your utility bills, extend the life of your equipment, reduce or eliminate the need for costly repairs and increase the performance of your heating and cooling systems. Lastly, you’ll gain peace of mind knowing you have a reliable and trusted company you can call whenever you have problems. Call us today at 1-877-757-1141 or click below for more information on our maintenance plans. Call us today at 1-877-757-1141 to sign up for our maintenance plan.